A highlight for me this week was a return visit from the Dudley Riverbank 5:5 Male. Now dominant to our east, the last time we had consistently seen this impressive male was around the time of his fight with the Marthly Male a few months ago. Since then he has kept his distance from the disputed territory! 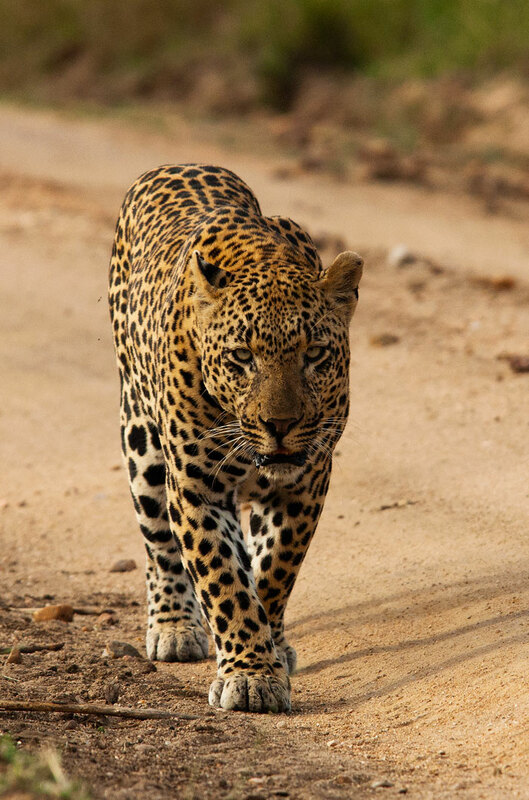 We watched him quietly walk down a long road which appears to be a boundary of his territory. He scent-marked along the way, although did not vocalize. 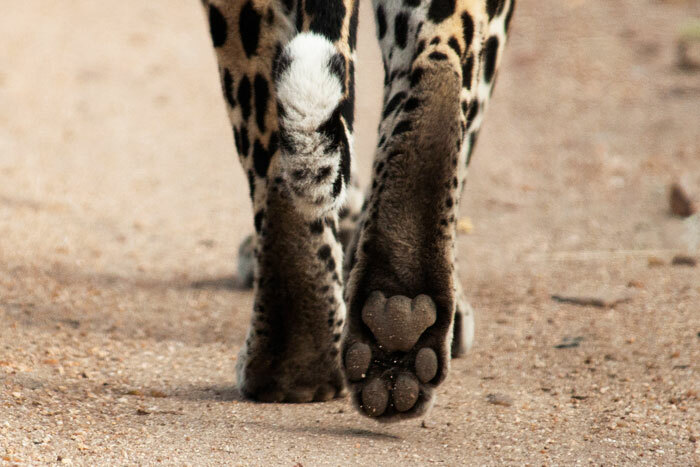 The heel of a leopard's foot has three distinct lobes, diagnostic when tracking cats. 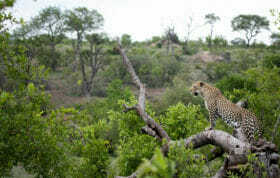 He eventually came to a spot close to the Sand River where another leopard had been that morning. Based on the tracks, we deduced it to be the Marthly Male, who had killed something which had been robbed by hyenas, early that morning. Once getting his scent, the Dudley Riverbank 5:5 Male investigated carefully... and quietly, in case his rival was still around! As he investigated the scene, at one point he used a tree for elevation as well as smelling around. It seemed that the Marthly Male had either tried to hoist the carcass into it, or perhaps had fled from the hyenas into the tree. 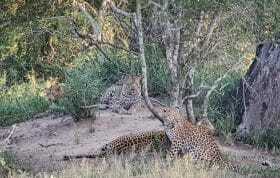 Eventually the 5:5 Male went back east, while the Marthly Male's tracks had gone west. Perhaps he thought it wasn't worth a potential fight. 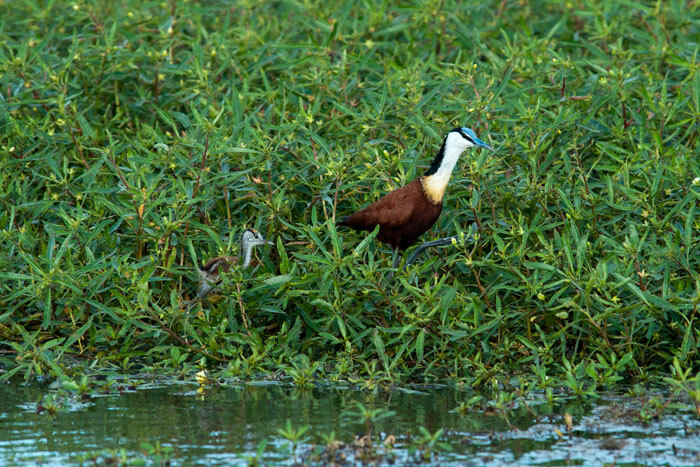 Another highlight was a sighting of an African jacana chick! The species is famous for the fact that the male does most of the parenting. 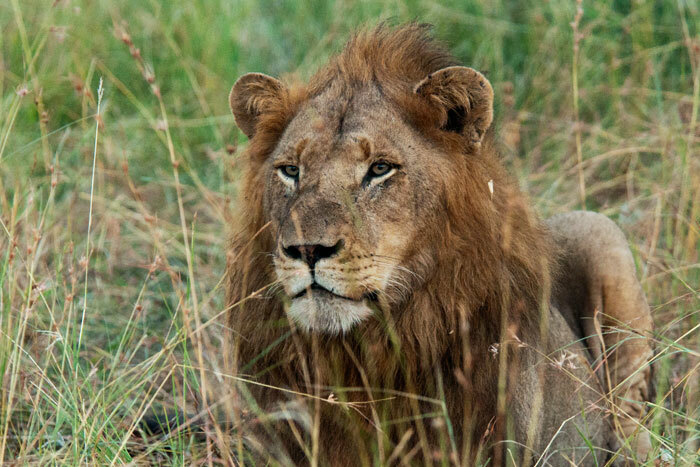 The Southern Pride Males took down a buffalo this week. 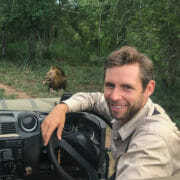 Here, during a break from feeding, one lion patrols for descending vultures and approaching hyenas and jackals. Nearby a jackal rustled in the grass, capturing his attention. 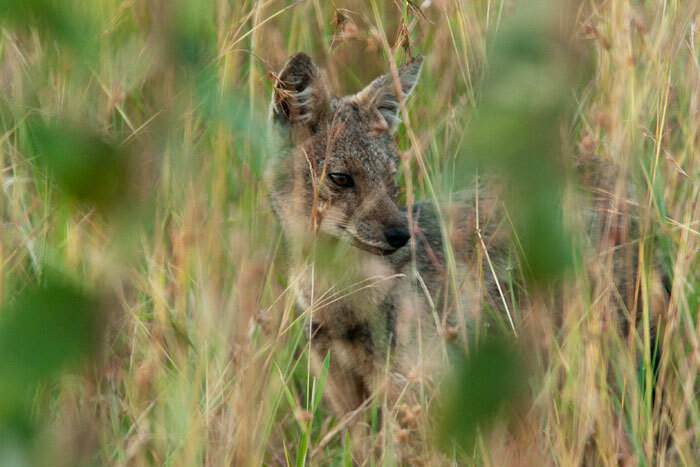 A well hidden Side-striped jackal stares at the buffalo carcass from a safe distance. 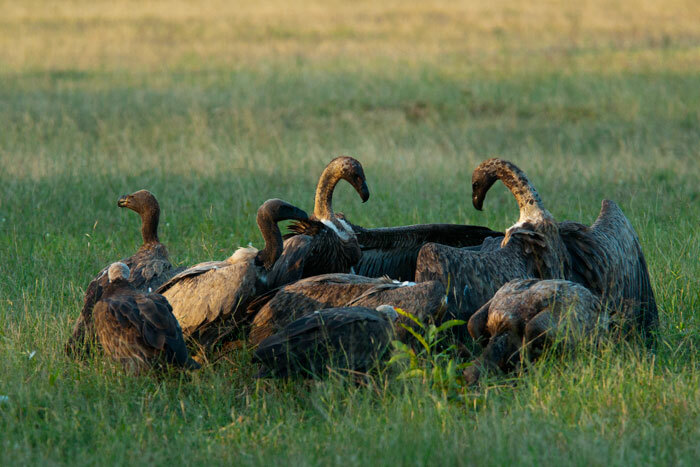 As with most large animal carcasses, the vultures waited in hordes for the apex predators to finish. This could take days of patience for them. 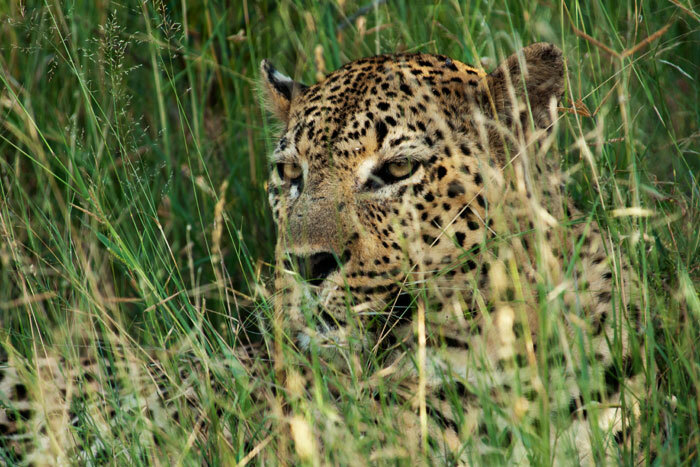 The Camp Pan Male conceals himself in long grass near Lex's Pan. 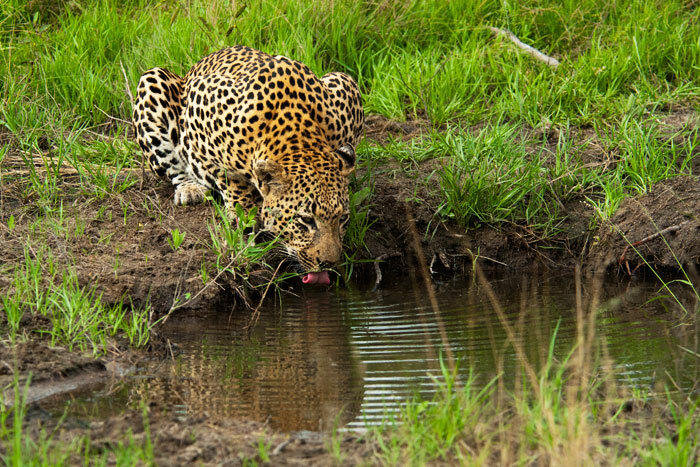 He was waiting for a herd of impala to come drink, but unfortunately, an elephant bull discovered him first and chased him, exposing him to the impala. He then watched the elephant move away with apparent frustration! 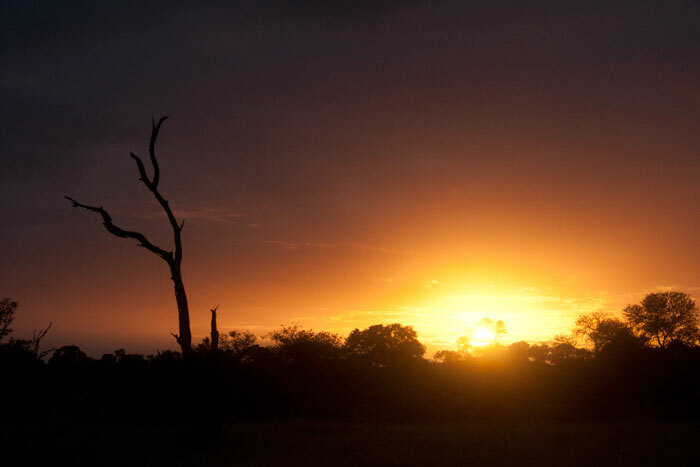 This week saw some particularly impressive sunrises and sunsets. 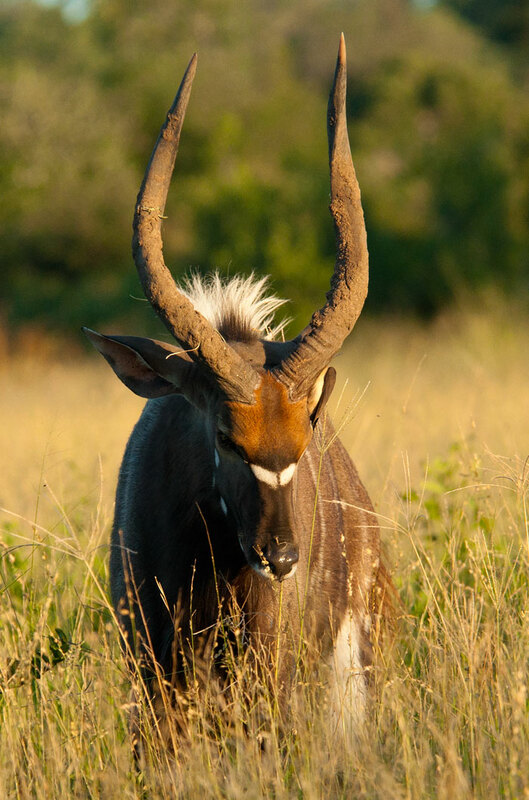 A nyala bull displays to an opponent. It is getting to be their breeding season, and the tension amongst the bulls is evident. A hippo sleeps midday in Maddie's Pan. They can sleep under water and come up for air without disturbing their slumber. A very exciting update on the Sparta Pride. 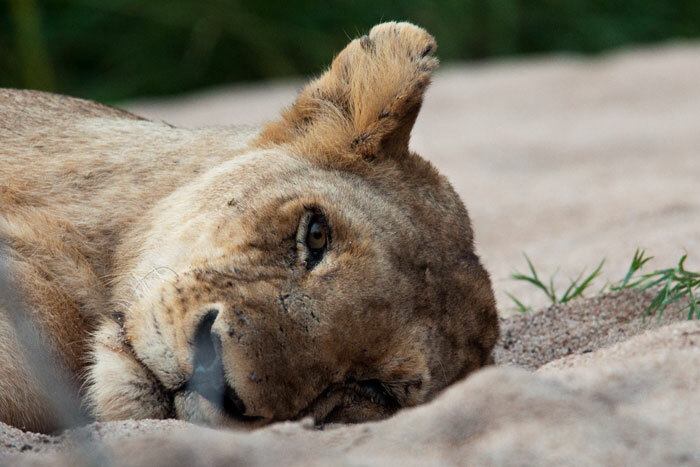 When we found this lioness one evening, she was lying in the Maxabene Riverbed all by herself, heavily pregnant. The next morning, when Renias and the tracking team went to find her, she was in the same spot... except with some tiny cubs hidden in the grass nearby! They had been born the night after this photo was taken. 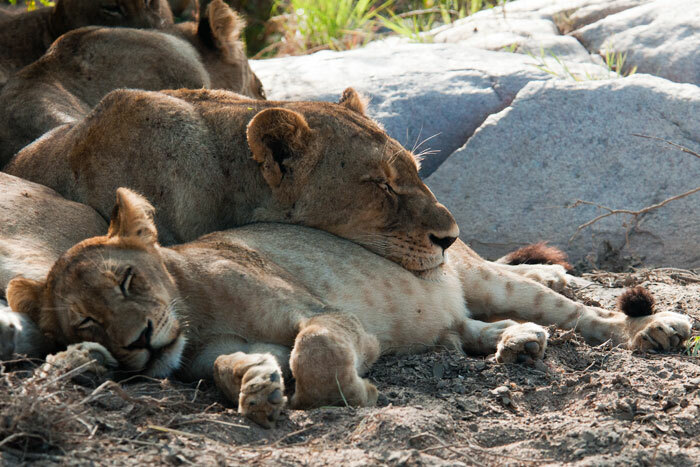 We will leave the cubs be for a few weeks, closing the area off from the vehicles so that they can peacefully become accustomed to their new world. Not sure how many there are, but we are very excited to see them once she reveals them to us! In retrospect, she looks like she knew she had a long night ahead of her! 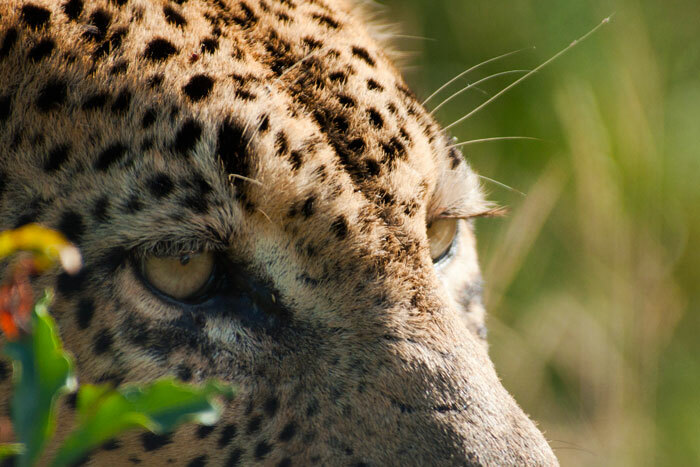 The left eye had been scratched a few nights prior in a fight with the Majingalane Males over a giraffe carcass. We don't think the damage is permanent, however. Another favourite sighting for me this week was of these vultures feeding on an impala carcass. The impala had died of natural causes, and the vultures found it quickly. It was interesting to watch the hierarchy of the species (the White-backed clearly dominant over the Hooded) as well as the intense fighting over the food. A very rare sighting! 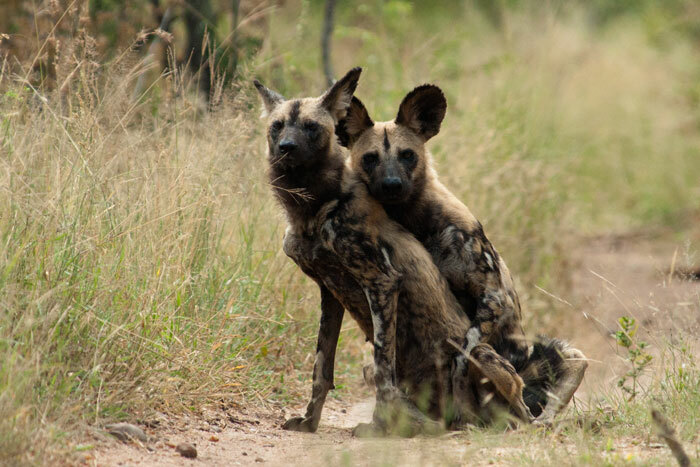 The pack of wild dogs was back this week, and the alpha pair was mating! Even Freddy had not witnessed such an event, and we hope to expect another litter after their two-month gestation period. Parasites, particularly ticks, are very prevalent in the area and the predators do not allow the oxpeckers to help them like they do the herbivores. They target areas like the ears, with soft skin and short hair. 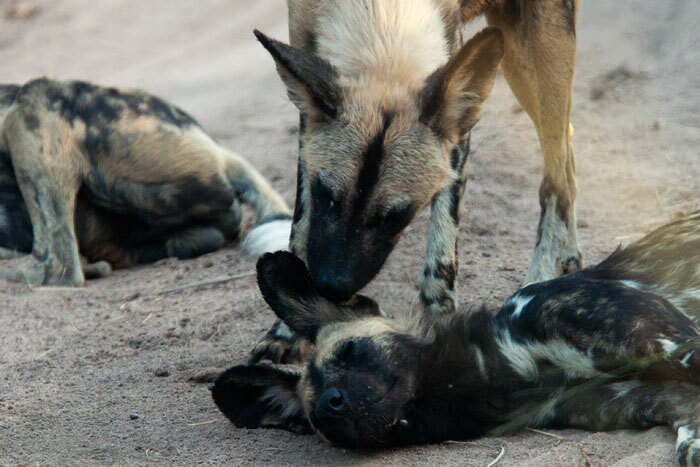 Luckily for this wild dog, however, a pack-mate was there to help her out by grooming her, picking off the ticks with her teeth. 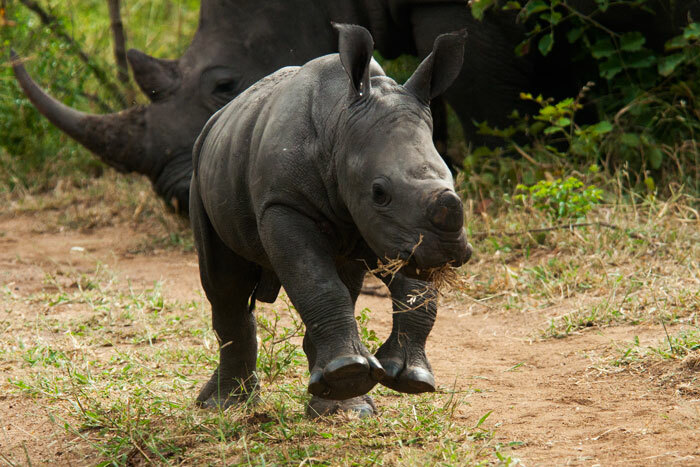 This baby rhino should really become the new anti-poaching poster boy! Anyone lucky enough to view him is immediately mesmerized by his vivacious, playful, and trusting energy. 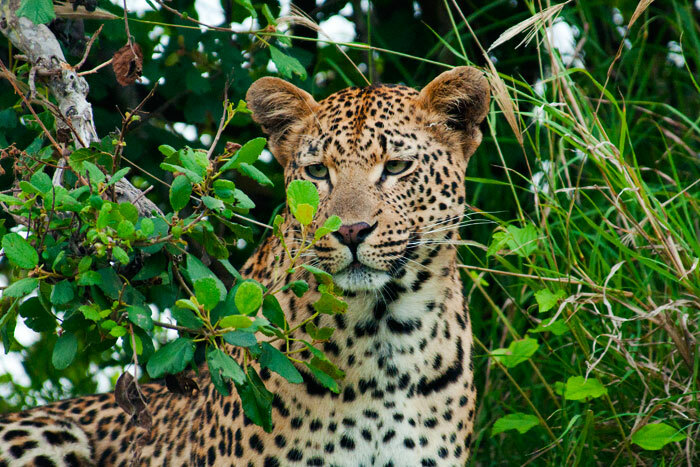 Around here, the big cats tend to steal the show, but lately this character is the one to see. As seemed to be the case often this week, sometimes the most exciting sightings are those that cannot be photographed. In this case, the Camp Pan Male was feeding from a carcass he had stolen from the Maxabene Female, which she had hoisted into this Marula tree. However, he then knocked it down, and instead of taking it back up, he proceeded to feed on the ground. This is a risky move at night, and indeed, soon afterwards a hyena approached unnoticed and quickly tried to grab the kill. 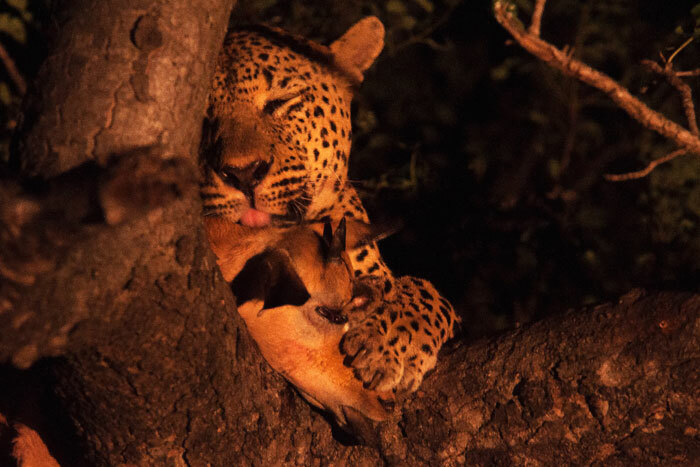 In an explosion of growls and shrieks, Camp Pan managed to fight off the hyena and leap into the tree with the carcass in tact. Amazing how much competition for one impala carcass! Be sure to watch the video of this incredible sighting which will be on the blog on Monday. 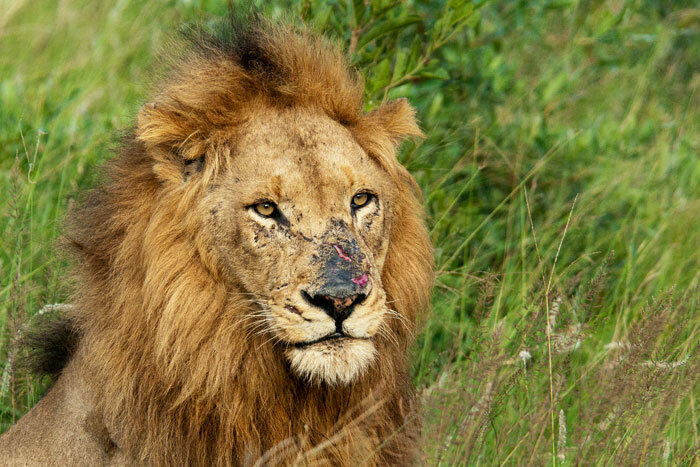 The scar-nosed Majingalane Male shows how he keeps that scar on his face! He had tried to mate with one of the Sparta Pride females who gave him a few hard smacks in the face. 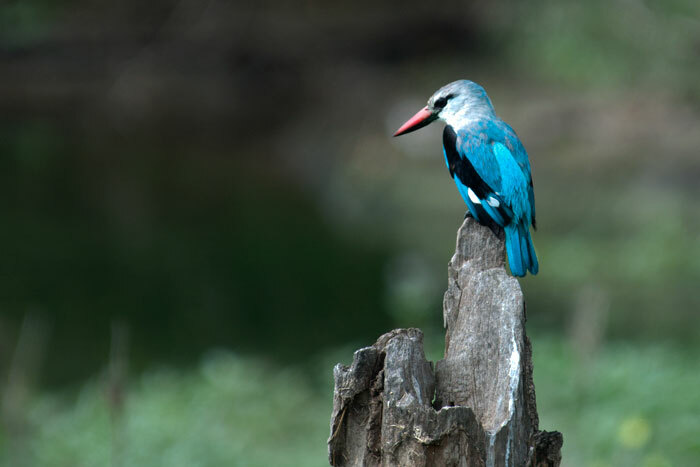 A Woodlands kingfisher looks into the water for a fish. Usually their diet consists mainly of insects, but with so much water around recently, it is common to see them fishing as well. 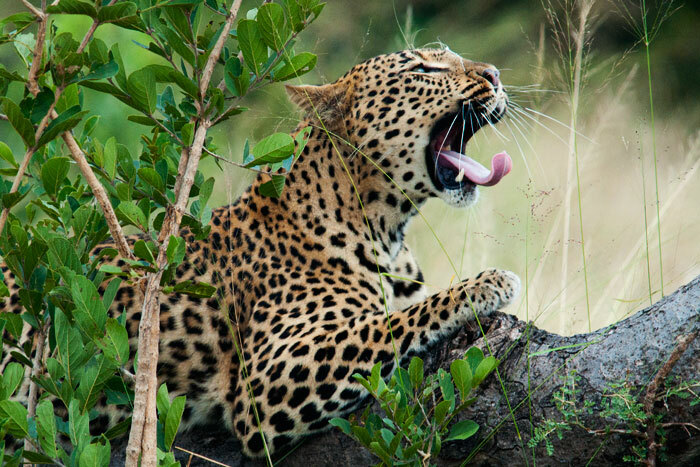 The Mashaba Female yawns from her perch on a fallen Marula, a sign that she would shortly become active. 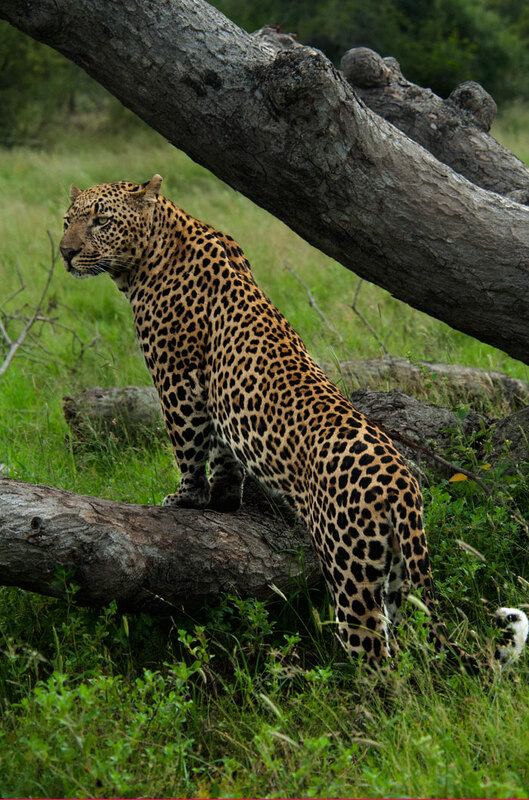 We watched her for a few hours as she patrolled her territory, looking for hunting opportunities along the way. From behind the leaf cover atop a termite mound, the Mashaba Female peers at some impala in the distance. 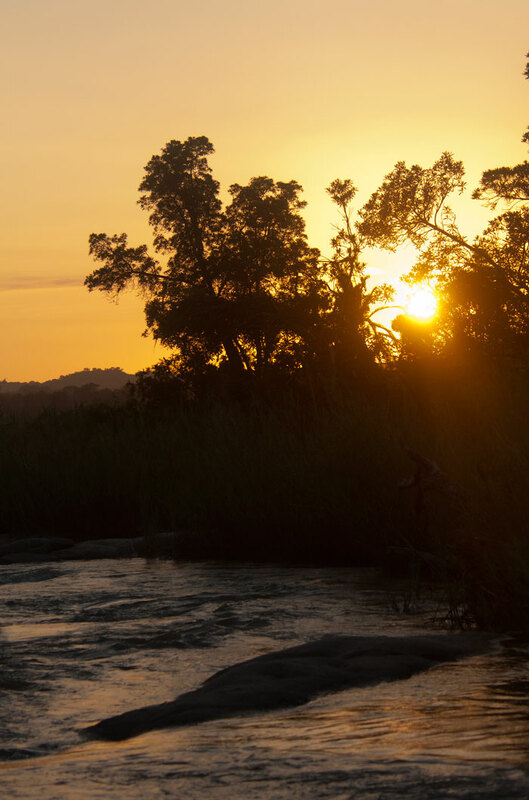 The sun rises above the Sand River. 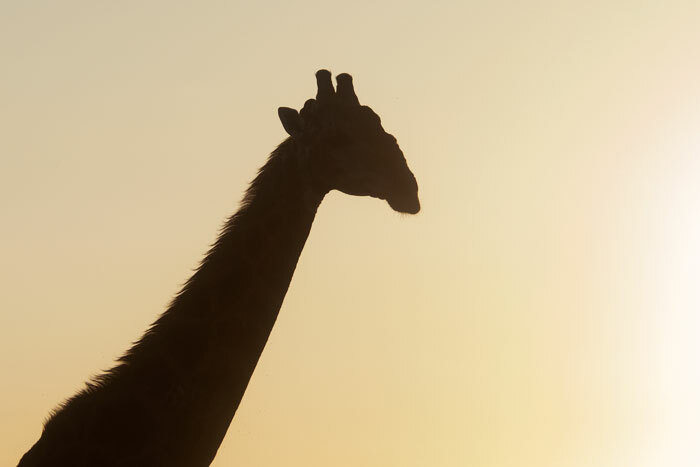 A giraffe is silhouetted by the sunset. Giraffe sightings were relatively rare this week, in my opinion partly due to the Sparta Pride having killed one earlier in the week. 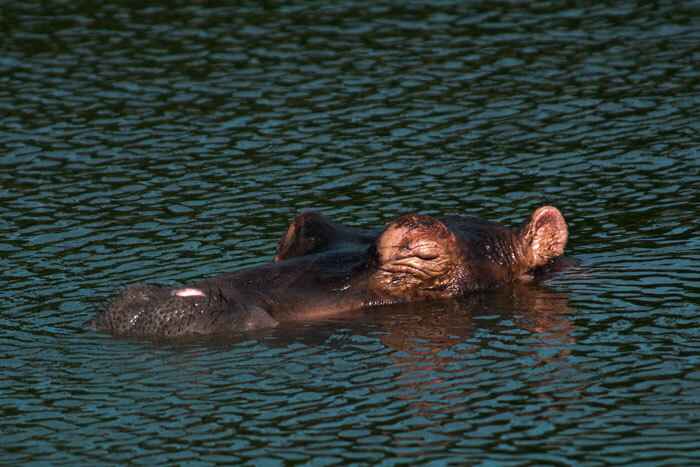 One of the Tsalala sub-adults soaks in the morning sun before it gets too hot. They were seen frequently this week around the Sand River, their old stomping grounds! Soon after, she came to join her mother - the only remaining lioness with a tail - and the rest of the pride in the shade. 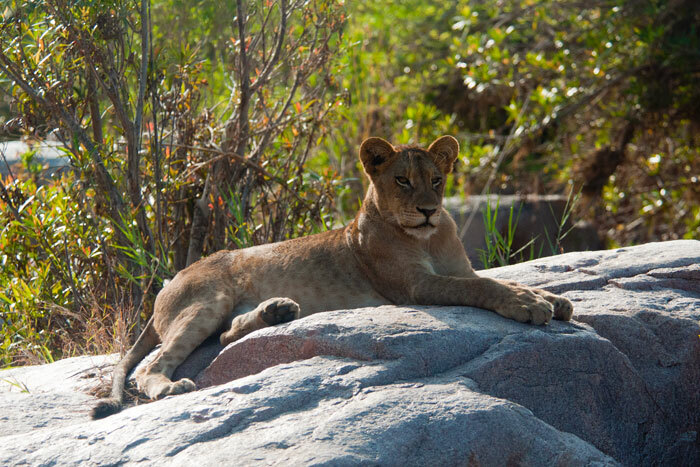 Then, however, the younger cub moved into her previous perch on the rocks. Jealousy ensued and she climbed back up the rocks to try and regain her spot with a not-so-subtle request! The younger cub voiced her lack of appreciation for the treatment! It is great to have this pride back in an area where we can view them, as we watch the surviving youngsters enter the next phase of their lives: growing up! Hi Talley, these are amazing shots. I’m not sure I have ever missed a place so much and it probably doesn’t help to look at your wonderful photos because they just keep reminding me. You seem to get excellent photos with the lens you use so I’m thinking that you don’t need a 400m! I look forward to seeing your blog every week. Please say hi to everyone for us. Stunning shots. The kingfisher is gorgeous. Fabulous pictures this week – wow! I particularly loved the baby rhino, so sweet! And also was excited to see the wild dogs mating, what an amazing sight. I am keeping my fingers crossed that they will have their pups nearby and I will get to see them when I am there in June! Awe-inspiring – sublime shots – and so much variety. 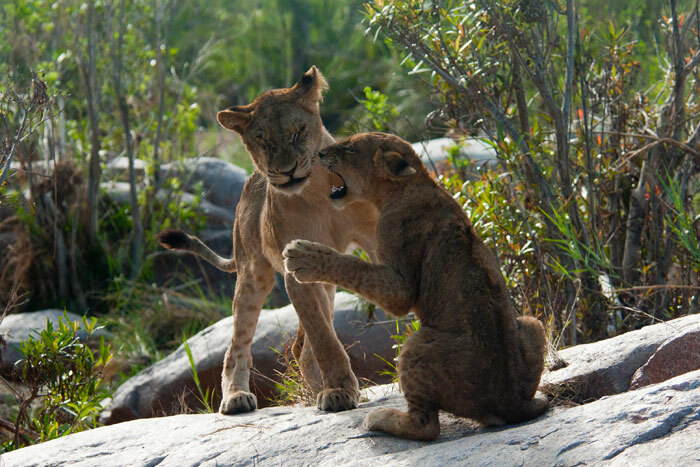 Lots to look forward to with new cubs and a rip-roaring rhino baby on your turf! Beautiful pics! Love the leopard ones and the lion cus are awesome! Thanks for posting. All such beautiful pictures. You captured so many great moments! 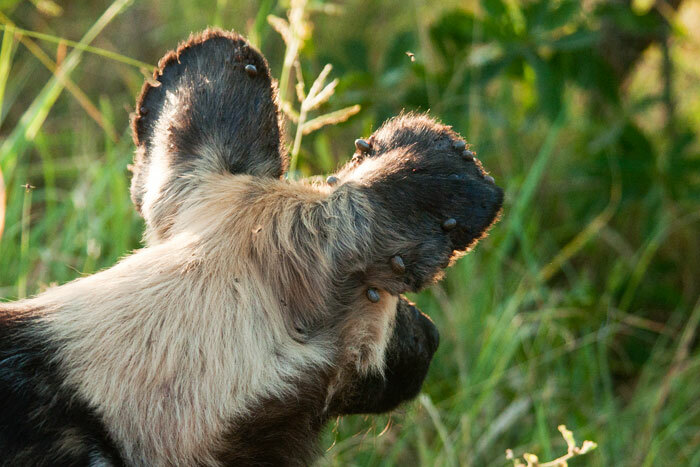 merci beaucoup Talley…fabulous …wild dogs mating… so so so…. and all the other ones… no comment.. just the pleasure to keep them in mind. As always absolutely beautiful pictures with well written blurbs for each! 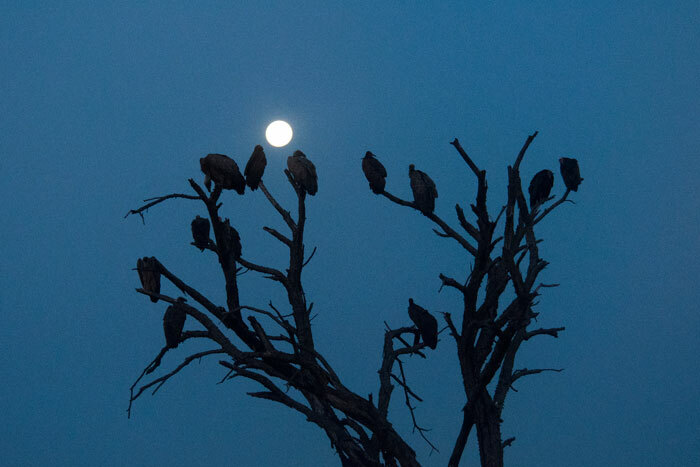 I especially love the vultures with the moon as backdrop…stunning. The wild dogs, wow what a sighting for you. Thank you Talley. Looking forward to next week! 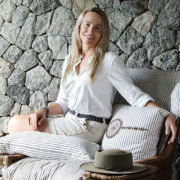 REALY LOVE THE PHOTO’S THANKS FOR SHARING !!!!! Great photos, as usual, Talley. 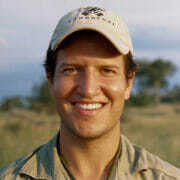 I love the jackal in the grass and can’t wait to meet the baby rhino! 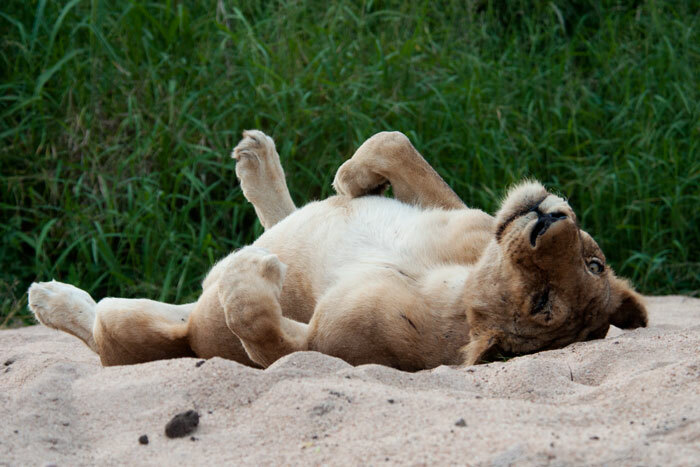 I think Londolozi should have a Baby Namibg contest (sort of like the Mid Ocean News baby contest!!) for the little rhino! I vote for Starlet! Thank you, Talley. Your consistent effort to keep us informed (and entertained) is much appreciated. I can’t wait to come back! This blog is really appreciated. 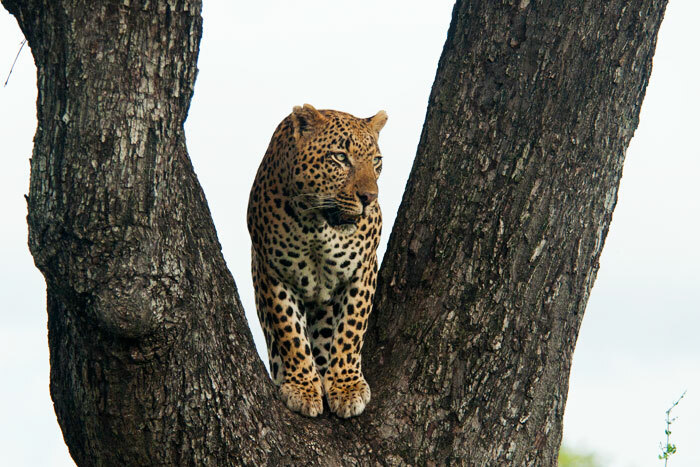 I love it all – the Lion warfare, the Leopard storylines, the competition among predators, the diversity of animals, the young animals, the beauty of the nature.